Start Cydia Impactor and drag the IPA onto the top field. Enter your Apple ID credentials. On your device, go to "Settings > General > Device Management" and trust the certificate. Run the app and tap on "Prepare For Jailbreak". Wait for it to respring, then launch Cydia from the Home Screen. Whenever you reboot, open the app again and tap on "Kickstart Jailbreak". Whenever the app expires, install it again with Cydia Impactor. 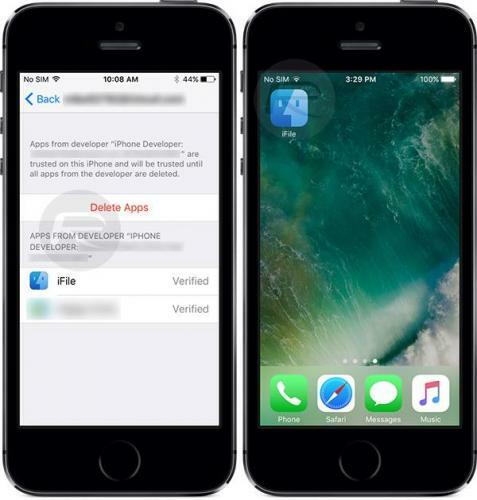 iFile is a file manager app for iOS that works without jailbreak. Cydia Impactor is a GUI tool for working with mobile devices. It has features already, but is still very much a work-in-progress. Electra is a free jailbreak tool for iOS 11.0 - 11.1.2. It is recommended to futurerestore before running Electra, although we have tested it to work if you are upgrading from an existing liberiOS or Electra beta installation. Although Electra itself should be safe, we are not responsible for any damage that may be caused to your iOS installation by any tweaks or executables you load after the jailbreak. Electra is a free jailbreak tool for iOS 11.2 to iOS 11.3.1.It is recommended to futurerestore before running Electra, although we have tested it to work if you are upgrading from an existing liberiOS or Electra beta installation. Although Electra itself should be safe, we are not responsible for any damage that may be caused to your iOS installation by any tweaks or executables you load after the jailbreak. Apple’s internal prototyping tools are typically utilized by quite a few internal Apple employees. With the various tools (PurpleRestore) you can restore a prototype firmware or other IPSW files to an iDevice. With another tool (PurpleSNIFF) you can read important information. These tools are very very hard to get and are mainly exchanged in the underground mostly with money or against other Apple internal software. PurpleRestore is a tool made by Apple and is used for flashing iDevices. It provides far more customization than iTunes, and it is usually used to flash internal firmware to prototypes. This tool can (and is meant to) handle multiple restores. When performing restores PurpleRestore color coordinates the device in the table and when the device is about to receive the AppleLogo it will turn the background color of the screen to the color assigned to the device. Like iTunes, PurpleRestore communicates with iDevices using a usbmux connection. "PurpleFAT" is an Apple Factory Activation tool, assumed to be used in factories for UUT's (units under test). If the unactivated device is plugged into a computer and the software is run, it searches for the device and would activate it (Seems not to work and just plays a sound saying "Oh nooh!") PurpleFAT needs an activation sever. https://albert.apple.com/WebObjects/ALUnbrick.woa/wa/deviceActivation does not work. Application can be locked for some security reasons, and requires a passcode when unlocking the interface (This passcode is stored in a string, when dissasembled can be found at __text:00003089). PurpleSNIFF is a tool made by Apple to read identification and diagnostic information from the device. The tool is used by Apple engineers as well as factory workers at Foxconn/Pegatron. It's included in the RestoreTools package. Like iTunes, PurpleSNIFF communicates with iDevices using a usbmux connection. PurpleBuildSanitizer is an Apple internal Mac application for stripping internal builds for internal use. When creating a stripped bundle, it names the folder like so, N92-INTERNAL-INSTALL-iPhone3,3_4.2.6_8E200_Restore. So, guys, I decided to improve a little bit the application I am working on. Now the app has an Alpha stage Key Grabber (sometimes gives wrong keys, still need to be adjusted). When the app will be good to release, I will inform you on a video. THE APP IS NOT RELEASED YET BECAUSE: Apple would patch it very fast. It is like jailbreak's destiny, Apple patches everything exploit-based. iOS 9.2.1 and 9.3 BETA were released in the same time as a trap for exploiters and Jailbreakers. That's why there is a Jailbreak for 9.2.1 but Pangu or whoever works on it don't wanna publish it yet. Apple knows people is desperate and they watch every move. When it would be safe enough, I will upload the app. Meanwhile, let's hope Apple don't patch my exploit by mistake like they did with one of Luca Todesco, and I will make the app stronger as now it is still so damn buggy. iDecrypt is a GUI front-end for VFDecrypt (resulting in this program breaking GNU GPL) for Windows /OS X. It's used to decrypt .DMG files, namely the rootfs of an IPSW file. Inside the folder there are several files Setup.app the (Info.plist) on (Multiterms.xml) on (ResourceRules.plist) and (Setup-Entitlements.plist) open the files with iFile and look the same files are opened and look for differences in the variables (True or False) so that the files on your iPhone will stay the same files that I've been through. Add the file to the Preference.app General.plist folder on your iPhone, and you also have to modify the data_ark (/ var / root / Library / Lockdown) and change the variable (BrickState) to the value (True). This tool allows you to ailbreak your iDevice with iOS 8.0 - 8.1 version. - Make a backup and Restore your iDevice with iTunes to avoid problems. This version installs Cydia in your iDevice. Please note Pangu is an untethered jailbreak for iOS 7.1, iOS 7.1.1 and iOS 7.1.2. [*]Please disable the passcode as the jailbreak may fail, if the passcode is enabled (Settings -> General -> Passcode Lock On -> Turn Passcode Off). [*]Take a backup of your device using iTunes or iCloud before proceeding. [*]Please ensure you’ve updated iTunes to the latest version. [*]Please note that jailbreaking your iOS device may void your warranty and hence proceed with caution and at your own risk. Mac users: Double click on the Pangu dmg file you just downloaded to mount it. 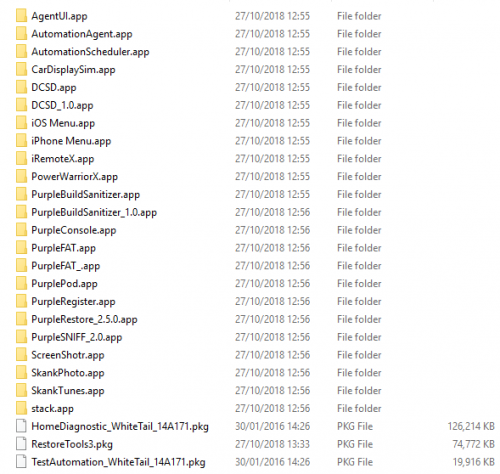 Windows users: Launch the Pangu exe file as an Administrator. Right Click on the Pangu exe and select the “Run as Administrator?? option. Step 3: You should be presented with a screen like the one seen below. Click on the black Jailbreak button. Step 4: Follow the on-screen instructions. The app will ask you at one point to set your iOS device to June 2nd. To do this, go to Settings -> General -> Date & Time. Step 5: After you change the date, it should restart the process and install the Pangu app on your iOS device. Step 6: Tap on the Pangu app on the Home screen of your device when prompted to continue with the jailbreak process. You will get a warning message, which will ask you whether you are “sure you want to open the Application “Pangu?? from Developer “iPhone Distribution: Hefei Bo Fang communication technology co., LTD???. Tap on the Continue button to continue with the jailbreak process. Step 7: Wait for your device to reboot several times. After a few minutes you should see that you have Cydia on your home screen and you’ll be ready to start installing tweaks on iOS 7.1.2. You can also revert back to set the time automatically via the Settings app. zip file is for windows..
Sn0wbreeze can jailbreak all iOS Devices from iOS 3.1.3 to iOS 6.1.3. Some of the jailbreaks are tethered. Absinthe jailbreaks all devices on iOS 5. It is an untethered jailbreak. Iphone Volume maximizer:Enjoy it Loud! runs louder, ask your eardoc! enjoy it LOUD and use it with caution!